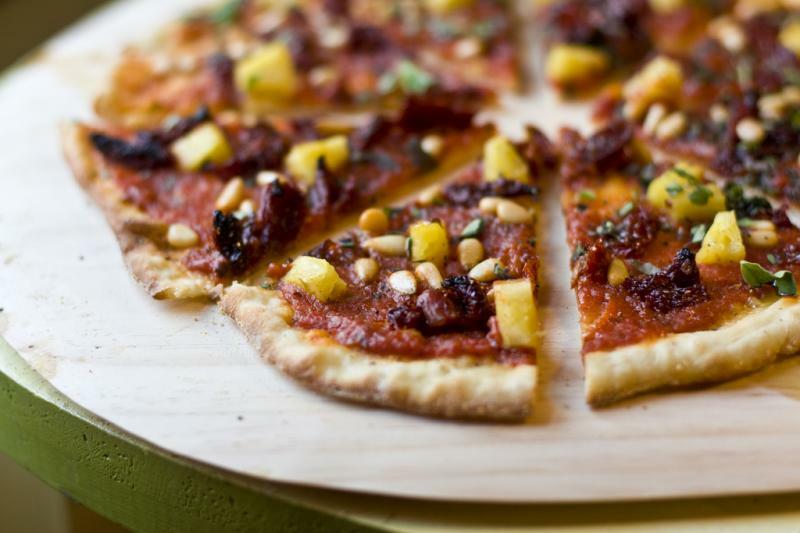 Get ready for a healthy Pizza Friday with this delicious Paleo Pizza recipe! Always begin your pizza making by preparing the crust. This is necessary for this recipe, as the crust requires some cooking time without the toppings. In a large bowl, combine the coconut flour, almond meal, baking powder and garlic powder. Using a whisk to eliminate any clumping, start mixing in the wet ingredients. I usually continue to whisk as I do this, because it helps prevent the dry ingredients from clumping. You will reach a point when your whisk becomes useless and your hands are necessary, generally when the mixture starts forming a batter. The batter will seem quite soft and much different in texture than the usual pizza dough, but once cooked it will take the right form. On a well greased and rimmed pizza pan, pour in the batter and spread it until it’s covering the complete surface. It’s important to use a rimmed pan so the batter doesn’t spill off. Throw just the crust in the oven and allow it to bake alone for 15-20 minutes. Meanwhile, prepare all of your toppings so that you just have to put them on once the crust has baked. For the mushrooms, simply heat a pan of a medium heat and cook the sliced mushrooms with the coconut oil for 3 to 4 minutes, until they are well-cooked. Spread the sauce on the surface of the crust, as much or as little as you like. Sprinkle on the sun-dried tomatoes, artichokes and cooked mushrooms and then top with the ham. With the oven still at 375 F, bake the whole pizza for another 10 or so minutes, just to allow the toppings to cook. And then that’s it! Little prep, little cooking, a great pizza to enjoy with your family or friends!